Trade union responses to the attack on wages by the EU! Home Editorials Trade union responses to the attack on wages by the EU! As part of the austerity programmes across Europe in response to the economic crisis, European Union (EU) institutions have increasingly become involved in an attack on trade union rights. In this guest post, Anne Dufresne highlights especially the attack on national wage formation and considers potential responses by European trade unions. Wages, and thus trade unions, are being violently attacked by European authorities. Until now, wages have remained an exclusively national issue as a negotiated right at the very core of trade unions’ identity. It had been excluded from the EU’s competences since the Maastricht Treaty. Yet, for approximately two years, with the implementation of the new ‘European economic governance’ (Pact for the Euro, Six-Pack,..), the economic actors of the EU have kidnapped wages. The ECB, DG ECFIN and the ECOFIN Council transformed it into a statistic figure of ‘Unit labour cost (ULC)’, measured as an indicator that should be contained in order to improve competitiveness. A threshold of wage increases should be respected to avoid a financial penalty. So, from a negotiated right at national level, wages have become a European market price! According to the European Council ‘the obstacles of institutional nature to a flexible adjustment of prices and salaries to market conditions (must be) suppressed’. And this is why since 2010, wage institutions have been suffering all over Europe, more or less violently so depending on the state of subordination of that particular country to the EU: with the authoritarian interventions of the Troika (Commission, ECB, IMF) and its compulsory austerity plans in the so-called ‘peripheral countries’ of the South, the East and in Ireland (unilateral reduction of minimum wages, brutal cuts in public services) or through recommendations of the Commission in the countries of the North (questioning of the indexation and wage stop in Belgium, reduction of minimum wages in France, etc.). 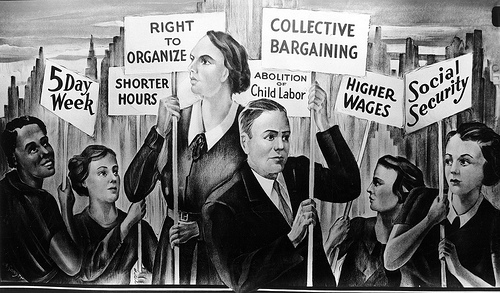 Dismantling collective bargaining systems that people fought for is equal to a frontal attack on the very existence of trade unions in each of the member states. The Commission makes no secret about this and indicated in a recent report of DG ECFIN that it should be possible ‘to promote measures that lead to a global reduction of the ability that trade unions have to set wages’ (2012). 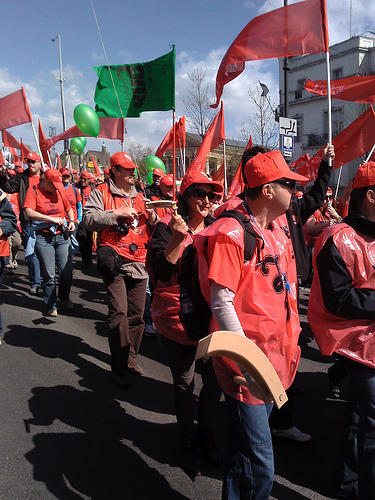 As they are facing this threat, how do European trade unions fight back? For too long, wages have remained a taboo issue for the European Trade Union Confederation (ETUC), which preferred the European Social Dialogue, excluding precisely wages. But the frontal attack perpetrated by the EU brought the subject to the foreground. 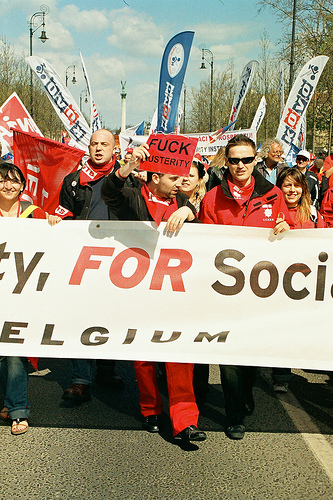 In April 2008, the ETUC organised the first European demonstration with the slogan ‘increasing salaries and better sharing of profits’, and not a vague slogan such as ‘for a Social Europe’. In May 2011, at its latest Congress in Athens, the ETUC was able to express a common diagnosis by the vast majority of European trade unions (only CFDT was of a different opinion): it clearly opposed the Commission and its governance and demanded the stop of the anti-salary bulldozer strategy of the EU. So, if there is a real consensus amongst trade unions to refuse persistent wage austerity, the key question is: how can we proceed? What could be the trade unions’ counter-strategy? A first answer goes back to the 1990s. 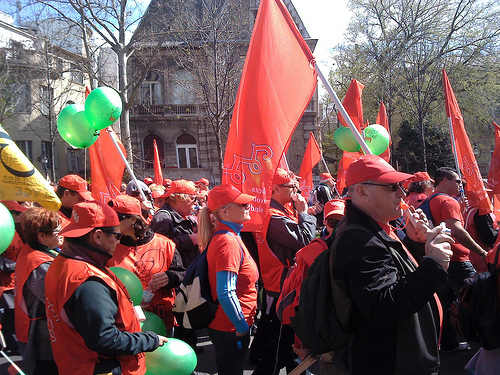 The ETUC, following the track of the European Metalworkers’ Federation, which in the meantime merged in the Federation of European Industries, with the chemical and textile Federations, had developed a strategy to fight wage dumping: the coordination of collective bargaining.The idea was to promote a ‘union’ wage norm, according to which real wages should at least increase in parallel with the increase of productivity. While the EU (regardless of inflation) now promotes nominal wages ‘according to productivity’ and pleads for a downwards harmonisation all over Europe, it is important to update this union norm and to reinforce the European coordination attempts by trade unions. A more offensive approach against the current European wage policy would be to promote the reinforcement of all collective bargaining institutions in the different countries in order to back a European growth policy driven by wage increases. A second line of inquiry: the European minimum wage, is a watchword that could impose itself given the differences in wages paid within the EU and the lack of a minimum level in some countries. A European regulation allowing for a relative increase in all countries could be the introduction of a minimum wage calculated in relation to the national average wage: 50% in the short-term and then 60% in the longer term. Trade unions in big countries are broadly in favour: French organisations with the ‘SMIC’ model, English unions with the success of their recently obtained minimum and the German unions that are looking for a universal standard before the next elections. Nevertheless, the ‘no front’, with the Italians and the Scandinavians in particular, is clearly against this because they fear that their bargaining systems of minimum sectoral wages, that are often very high, might suffer. Their veto has been blocking all demands in this matter since the beginning of the century. The current impossibility to find an agreement on this issue, despite the ever increasing assaults against wages, shows that there is still a long way to go before obtaining a common bargaining dynamic at the transnational level. So a lot of questions are left over: how can we break the deadlock of national withdrawal by trade unions? How can we avoid an unbalanced increase between countries, social tensions and eventually the stalemate of the trade union movement? How can we create a new balance of power in response to the economic players of the EU? This post was first published by the Social Europe Journal. Anne Dufresne is a Researcher at FNRS-FRS of the UniversitÃ© Catholique de Louvain, Belgium and a Research Fellow at IRES, France.